At the minimum, you will need to complete all the requirements of a postsecondary certificate program for court reporters in order to become a court reporter. These programs are offered at technical institutes and community colleges. In addition, once you are hired as a court reporter, you will be provided with a few weeks of on-the-job training. If you are working in legal settings then it is likely that your state would require you to be licensed or certified by a professional association. You will need a high school diploma or its equivalent to enroll in this program. The main emphasis of this program is to help students in the usage of stenotype machines, legal and medical vocabulary and the shorthand writing method. Students will further practice listening and recording information quickly and accurately. At the end of the program, students must typically pass a shorthand typing test. There may also be minimum GPA requirements. Once you obtain this certificate, you may be eligible to take the licensing exams and typing-speed tests. These exams and tests are required by most employers and states. All in all, this certificate program may take a year, 18 months, 2 years or even longer to complete. They may also be offered online. You can also become a court reporter by completing an undergraduate degree in the field. You would want to pursue this option for the sake of better employment prospects, salary and promotions. A degree program in this field is also more extensive than the certificate and therefore graduates enter the field of court reporting with a broad understanding of the profession. The ultimate objective of this degree is to help graduates pass the required standard state examinations. This degree program may be offered during the day, in the evening and online. 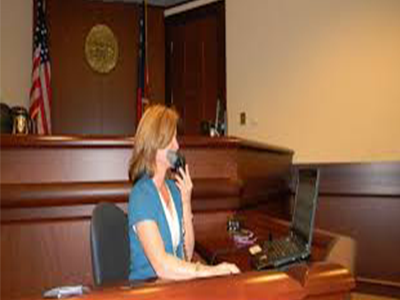 Once you are hired as a court reporter, your on-the-job training will begin. This may last a few weeks. This training would typically involve using specific types of equipment and technical terminology that may be used during complex legal proceedings. Licensing requirements vary from state to state and as mentioned earlier, many states require court reporters working in legal settings to be licensed or certified. If you are looking for information on court reporters certification then you should visit the official website of the National Court Reporters Association (NCRA). If you require information on digital and voice reporters’ certification then visit the American Association of Electronic Reporters and Transcribers (AAERT) website. Voice reporters however have the option of obtaining certification from the National Verbatim Reporters Association (NVRA) as well. In order to renew their certifications, reporters must obtain a certain amount of continuing education credits. A vast majority of the court reporters work for state governments, business support services and local governments. Only a small minority works as self-employed. Those working in a court setting usually work full-time. While there may not be many job opportunities available for self-employed court reporters, one of the biggest benefits of working as one is making your own work schedule. You need some post-high school level education, training and possibly a license or certificate to work as a court reporter. The time it will take you to become one will depend upon your chosen educational path and how soon you get hired as a court reporter.